Intelligent Virtual Assistant « Global Market Insights, Inc.
Smart speaker industry has been the recipient of a plethora of megatrends that are indeed underlining its massive expansion. Pioneered by Amazon, the Echo made its mark as the first product to debut across this business space in 2014, post which the smart speaker industry is witnessing an inflection point with the influx of new players in the business wanting exploiting the future growth prospects. Speaking of which, the last three years have also witnessed the incursion of Chinese competitors in smart speaker market, leading to a massive diversification in the product landscape. The recent trends of IoT and artificial intelligence have had a commendable impact on the development of smart speaker market. The robust proliferation of the internet has further aided smart speaker market growth in the last few years. Apart from the rising penetration of consumer electronics and high demand for wireless connectivity, technological interventions have also allowed manufacturers to introduce products that are not confined only to playing music, but have extended their applications to problem-solving, setting reminders, streaming of news and music with a single voice command. Integration of virtual assistant software has further played a pivotal role in reshaping the business model of prominent contenders. Google Home, for instance, powered by Google is profoundly considered one such technological breakthrough. The smart speaker market size, by the end of the next few years is forecast to outpace all records by collecting a revenue of USD 30 billion. Primarily dominated by intelligent virtual assistants such as Siri, Google Assistant, Cortana, Alexa, and many others, this business space stands to gain appreciable proceeds through the efforts of established contenders and new entrants striving to bring innovative products to the fore. Google for instance, recently made it to the headlines for having announced its supposed launch of homegrown smart display later this year. The Google Home family, comprising the standard Home, the premium Home Max, and the affordable Home Mini, would indeed provide stiff competition to Amazon’s Echo Show with this introduction. The United States being one of the most progressive nations as far as technological penetration is concerned, observes an upper hand in the global smart speaker industry. 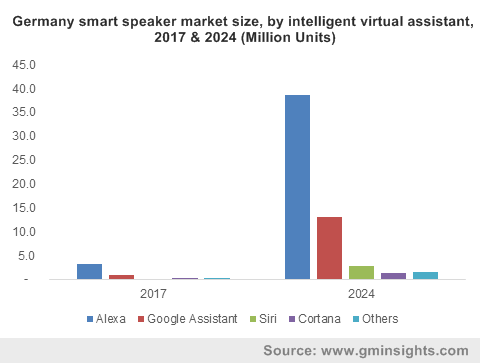 Increasing regional demand for wireless connection and rising IoT applications is driving the U.S. smart speaker market. But the one factor that has been undeniably impelling the regional industry is the escalating penetration of smart homes in the nation. A research study conducted by U.S. tech magnate Metova claims that more than 85% of consumers in the U.S. now own some form of smart home device, while over 65% have already purchased a voice-controlled system such as Google Home or an Amazon Alexa. It is thus rather over that smart homes have extensively proliferated the masses, a factor that would be majorly responsible for the expansion of U.S. smart speaker market. Despite having associated risks such as security breaches and data threats, the smart speaker industry is certain to witness a phenomenal demand over the coming years. 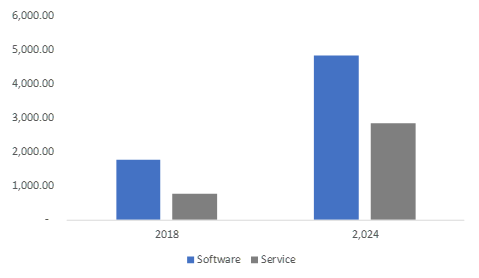 The projected growth curve of this market aptly justifies that this vertical holds a tremendous set of opportunities for application developers, component suppliers, network operators, and several other vendors. Global Market Insights, Inc., projects the overall smart speaker market size to register a massive CAGR of 33% over 2018-2024, in terms of shipments. This entry was posted in Electronics and Media and tagged Alexa, Cortana, Global Smart Speaker Market, Google Assistant, Intelligent Virtual Assistant, Siri, Smart Speaker Market, Smart Speaker Market Analysis, Smart Speaker Market Forecast, Smart Speaker Market Growth, Smart Speaker Market Penetration, Smart Speaker Market Report, Smart Speaker Market Size, Smart Speaker Market Statistics, Smart Speaker Market Trends.